Urubamba is the largest town in the Sacred Valley and lies at an important junction of the Cusco-Chinchero-Urubamba-Ollantaytambo road and the Pisac-Calca-Urubamba-Ollantaytambo road. Therefore it is highly likely that you will pass through the town several times during your visit to Cusco and Machu Picchu, in fact its pretty difficult to avoid it. Urubamba lies beside the Urubamba River from which this section of the fast flowing river takes its name. As the Urubamba River flows towards Ollantaytambo and Machu Picchu it takes on the name Vilcanota River. Urubamba is located approximately 53km (33 miles) from Cusco, and takes about 1 hour 15 minutes by taxi and a little longer by public bus. Its another 19km (12 miles) from Urubamba to Ollantaytambo (30 minutes by bus) and 40km (25 miles) from Urubamba to Pisac (1 hour by bus). Urubamba lies beneath the snow-capped Chicon mountain 5530 m (18,140 ft) which is clearly visible especially when arriving along the road from Chinchero. 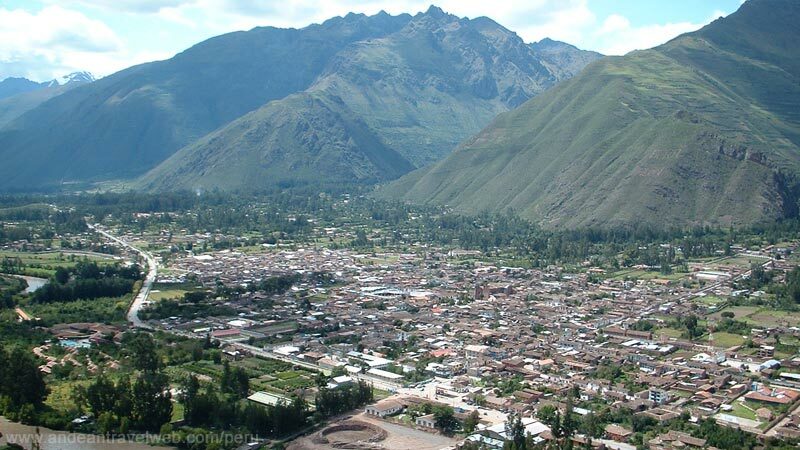 Urubamba has a pleasant climate and at an altitude of 2870 m (9416 ft) above sea level it offers a bit more oxygen than Cusco at 3360 m (11024 ft) and is regarded as a good place to go to acclimatize to the elevation to prevent altitude sickness. Urubamba is considered more of a commercial hub rather than a tourist attraction in itself but the local market selling fresh fruit and vegetables and pots and pans and other essential items is perhaps a better way to see how the locals really live rather than the overly touristy market at Pisac. Its wide open Plaza de Armas, warm climate and laid back atmosphere make it popular with visitors and many ex-pats have decided to make Urubamba or the surrounding villages their home. You can also find some superb accommodation in the area ranging from luxury hotels, family-run farm houses to yoga and meditation retreats.